IN a world of ruthless competition and naked aggression men used to be men. But today some of the most powerful business positions in the world are held by women. One such lady is Perween Warsi, Britain’s second richest woman of Asian origin and also known as The Curry Queen. How did she make it to the top and how is she taken by the predominantly male establishment is a question that many would like to know. Discovery takes a look into this charismatic woman’s life in the premiere programme Boss Woman: Perween Warsi — The Curry Queen on Saturday, August 30 at 10 p.m. It reveals the secrets and inspiration, power and glory behind one of Britain’s top female bosses. Having moved to Britain in 1975 with her husband, she had no formal education but just one simple idea: "To see the whole of Britain enjoying my food." And over that idea she has built an empire with an annual turnover of $ 150 million. One of the biggest employers in Derby, she plans to continue building up her dream. As she explains, "Success is a journey not a destination. It doesn’t end." 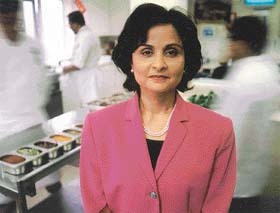 Don’t miss the story of this gritty woman who has won a range of honours, including an MBE for her services to the food industry. Emboldened by the success of Karishma: The Miracle of Destiny, Sahara Manoranjan is racing ahead with new shows and serials. One of these is Arzoo Hai Tu, Monday to Thursday at 8.00 p.m., a new soap which has the usual ingredients — intrigues, ambitions, aspirations, jealousies and hate — all wrapped around a love story. The star cast includes names like Mohnish Behl, Aman Verma, Mrinal Kulkarni and Sudha Shivpuri. Shankar, Ehsan & Loy have composed the title music. Arzoo Hai Tu revolves around a woman dejected in love who meets with a train accident. A co-passenger who is a widow dies in the mishap leaving behind a toddler. The woman assumes her identity picks up the child and goes to live with the widow’s in-laws who had never seen their daughter-in-law before. Things seem to be settling down for the lady till fate intervenes and the man who had loved her comes to her town and their worlds meet again. Will she admit she is not the widow and go back with her lover or will she adamantly refuse to disclose her identity? If you haven’t seen the 1970 Rajesh Khanna-Asha Parekh blockbuster Kati Patang, you’ll never guess the end! If you have, you will be overcome with a strong sense of deja vu. Back in school, her honey-toned baritone easily won her a place in the choir. So it was natural that she’d make a career in music. 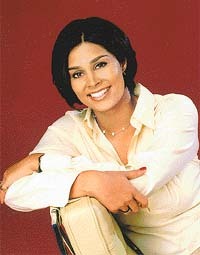 But before that Nafisa Joseph picked up the Miss India crown and also became the first runners-up at the 1997 Miss Universe. Only then she became an MTV veejay. But now, after four years of anchoring shows like Megamix and Housefull she has bid adieu to the music channel and stepped into a new field of dreams. She’s anchoring an international travel show, where she’d be exploring exotic countries like Austria, Australia, Russia and China. The best thing about the show, says Nafisa, is that she’d be visiting many of these destinations for the first time herself. But she isn’t leaving the music scene altogether. She’s signed a deal with Tata’s Idea Cellular music messaging service to become India’s first cellular jockey. "It’s very different from being a veejay. Here you can send personal messages without losing your privacy as it happens on television," says the self-confessed SMS junkie. Different notes. If the golden-hearted Son Pari on Star Plus bagged the best Jaduee Kirdar award then Meri Biwi Wonderful, every Thursday at 8 p.m. on Sony Entertainment Television, has not been lagging behind in popularity and is inching towards is golden jubilee. The Indian ‘version’ of Columbia Tristar’s super-duper comedy, Bewitched, has the viewers enthralled — especially those who have not seen the original. The story has now taken an interesting turn. Angela and Raj’s newly born baby girl is secretly taken to the fairyland by her grandmother. A completely foxed and befuddled Raj takes Angela’s cousin sister to be his infant daughter who he thinks has been transformed into a teenager. The birth of the baby girl has given a fresh impetus to the serial which is all set to start its second year on air. The only problem in the otherwise well-enacted comedy is its rather jaded laughter track. Some situations are genuinely funny but the producers seem to lack confidence and are overdoing the fake laughter. Following the track of the African Journalist Award, held every year in South Africa, CNN has launched a Young Journalist Award for India. "The award seeks to reward young Indian reporters who pursue the fundamental tenets of journalism while practising their craft. Through these, CNN hopes to nurture journalistic brilliance among young journalists," says the channel’s international anchor Zain Verjee. The award is open to television, print and online categories for journalists in the age group of 22-26 years. The television category needs to submit a 2.30-minute news feature style TV package based on CNN’s programme World Report, whereas the print journalists would have to submit their best byline story between January 1 and September 30, 2003. All contestants must have a minimum experience of one year. The winners get a chance to undergo an intense schedule at the CNN headquarters in Atlanta, designed to add value to their existing skills. They meet the CNN international editors and anchors and get a first-hand experience of the working skills. So all you young minds gear up for the competition and if you’ve got what it takes, then flaunt it! For 140 million years, the monstrous dinosaurs ruled the earth. They not just survived but evolved and flourished. Then, mysteriously they vanished. Why did they vanish so suddenly without leaving a trace? The National Geographic Channel in a quest to find out more about these mammals airs the Dino Week from August 25 to August 29 every night at 10 p.m. The series tries to solve various mysteries that revolve around these giants. Through the week scientists Paul Sereno and croc doc Brady Barr, trail the massive 35 feet ancient crocodile Sarosuchus. Other scientists find out that these monsters had a soft touch, they brought home meat for the young ones and also helped their injured mates. Explorers try to solve the mysterious vanishing of dinosaurs in the forests of Yucatan peninsula as they find evidence of enormous craters that may unravel the mystery of their demise. It’s a race against time for the scientists in China who try to protect the rare and invaluable fossils from the hordes of looters who have wealthy links in west. If you enjoyed Jurassic Park you’ll find the Dino Week exciting stuff.